Said Mr Lee: "Only by living, working, studying, serving, playing, mourning and celebrating together do we become one people, one nation." We must keep Singaporeans together. Maintaining social harmony is very much at the top of the Government's priorities. There are three aspects of this issue: income inequality, social mobility and social integration. They are inter-related. Over the last half century, income inequality has increased in almost all developed economies, including Singapore. The problem is most acute in large cities, for they tend to be where a country's wealth is created and concentrated. Singapore is both a city and a country. Our Gini coefficient is higher than that of many other advanced countries. But it is similar to or lower than other large metropolitan centres such as Beijing, Shanghai, London, New York and San Francisco. Despite the longer term trend of growing inequality, over the last 10 years, income inequality in Singapore has declined slightly. The Gini coefficient has fallen from 0.470 in 2006 to 0.458 in 2016. After we account for government taxes and transfers, the 2016 figure was even lower at 0.402. And unlike in many developed countries, the real per capita household income of the lowest quintile increased by 40 per cent over the same period, keeping pace with the median household. As globalisation and technological disruption have widened income inequality, the Government has over the years intervened more aggressively to support the less well-off. In the long term, quality education, home ownership and affordable healthcare are the fundamental means by which our citizens, especially those from poorer backgrounds, can improve their lives. In addition, we have many targeted, means-tested assistance schemes which provide transfers and subsidies to lower-income groups. For example, the Workfare Income Supplement scheme tops up their cash earnings and CPF accounts, and helps them build up their retirement savings. Over the years, we have made significant changes to our system to fund this increase in social expenditure - from the introduction of GST in 1994 to the increased reliance on Net Investment Return Contributions (NIRC) as a source of revenue. NIRC is now our largest revenue source, exceeding any single tax, including the GST. But though we have far more extensive social safety nets now than we did in the 1970s and 1980s, it is important to strike the right balance: Providing sufficient transfers to support those who need extra help so they can help themselves, but without diminishing their incentive to work or discouraging enterprise. The second aspect of this is social mobility. Some degree of income inequality is natural in any economy. It gives people the motivation to strive to do their best and improve their lives. But in a fair and just society, this inequality must be tempered and complemented by social mobility. Every citizen, no matter what his social background is, must have the opportunity to do better and move up in society, based on his efforts and talent. Nobody should feel that his social position is fixed based on his parents' income level or position in life. Many government policies are directed at improving social mobility and countering the tendency of a mature society to stratify. Education is a critical plank of the Government's efforts. We have made major investments in our pre-schools and school system to ensure that every child has access to quality education and a good start in life, regardless of income. MOE's Financial Assistance Scheme, and substantial bursaries and subsidies, make quality education affordable to all. There are countless examples of children from low-income families who have risen to the top in the professions, academia, government and the private sector with the support of these schemes. New programmes like KidStart will further strengthen the support system for children from lower-income and vulnerable families. We are also investing in our people through SkillsFuture to ensure that Singaporeans can continue to improve themselves and their prospects throughout their lives. Because of these measures, our social mobility is good compared with other countries. One study, looking at the proportion of children from the 20 per cent of households with the lowest incomes who do well in life and later reach the 20 per cent of households with the highest incomes, found a higher proportion in Singapore making this transition than in the United States or Denmark. We must not and will not let up on maintaining social mobility, because it will get harder to narrow and bridge class divisions as our society matures. The third aspect is social integration. We want Singaporeans to feel that we are one society; that we share experiences, values and outlooks; that we identify with and care for one another; and that we are united and will fight together in the face of adversity. Moderating income inequality and ensuring social mobility will help to strengthen our cohesion. In Singapore's multiracial, multi-religious context, we have to do even more to reinforce our shared values, and actively create opportunities for interaction and integration both across different social classes and between different races and religions. Only by living, working, studying, serving, playing, mourning and celebrating together do we become one people, one nation. 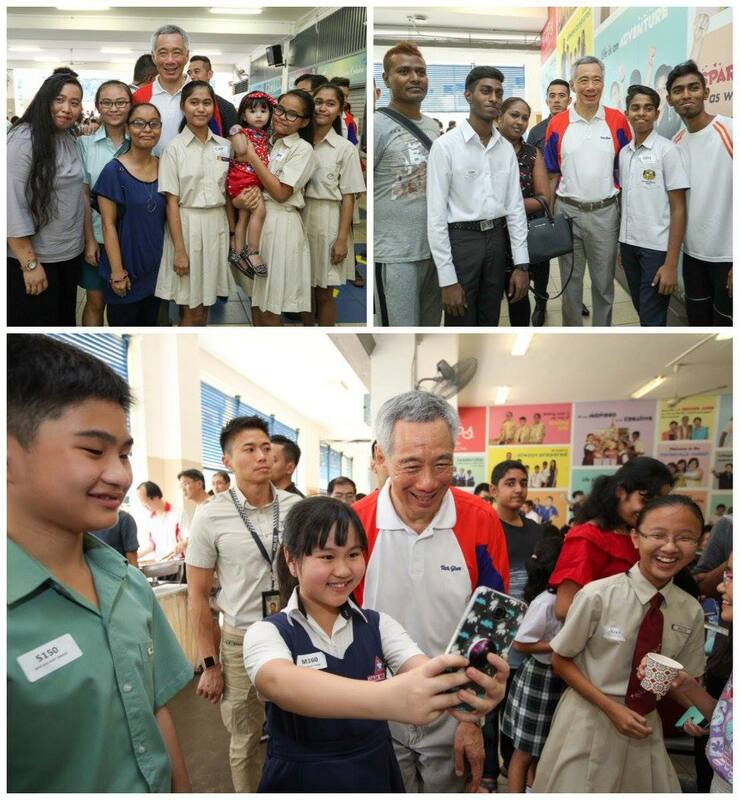 In Singapore, we are deliberate and proactive in our approach on social integration. The Minister for Culture, Community and Youth has responded in a separate reply on our measures to promote social mixing and integration. In particular, our urban planning and public housing policies have enabled ethnic and social integration, and distributed access to good schools, healthcare, parks and recreation across the island. We design shared spaces within our neighbourhoods, such as the playgrounds and parks, shopping malls and hawker centres, and sports facilities, in order to maximise social interactions. Hawker centres are a uniquely Singaporean institution where people of all backgrounds mingle and enjoy good, affordable hawker fare. We have a good mix of flat types in each HDB neighbourhood. The People's Association organises all sorts of activities in our neighbourhoods and precincts, bringing together people from all walks of life. In national service, Singaporeans train and serve together in the defence of our nation, strengthening our national identity and fostering cohesiveness. The issues of mitigating income inequality, ensuring social mobility and enhancing social integration are critical. If we fail - if widening income inequalities result in a rigid and stratified social system, with each class ignoring the others or pursuing its interests at the expense of others - our politics will turn vicious, our society will fracture and our nation will wither. This is why this Government will strive to keep all Singaporeans - regardless of race, language, religion or social background - together. There is already a concerted and coordinated effort among government ministries to tackle these challenges together in various fora. It is, therefore, not necessary to set up a specific inter-ministerial committee to look into these issues. 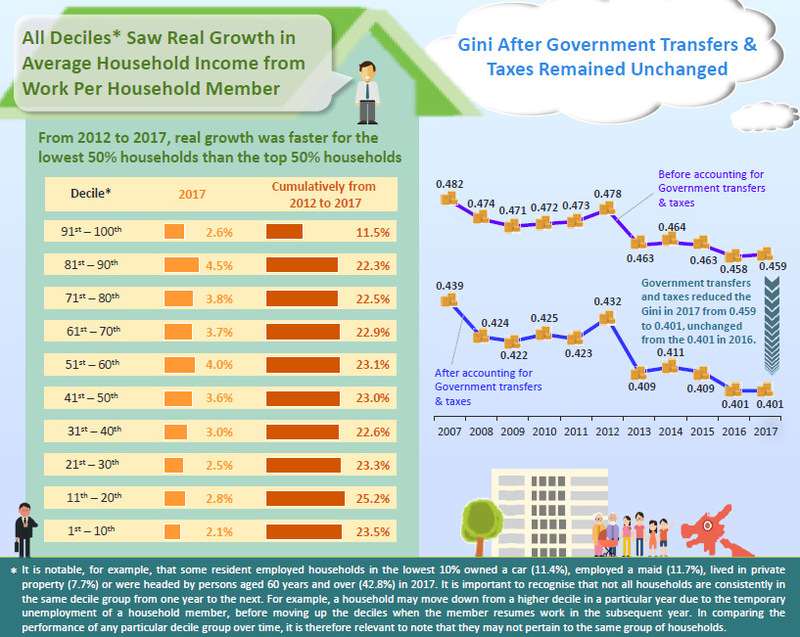 Incomes from work of less well-off families in Singapore grew last year - but at a slower pace than those of better-off households. 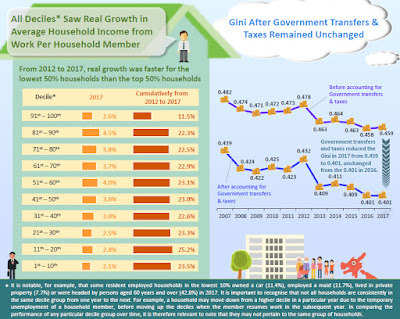 A Department of Statistics report released yesterday showed that the bottom half of Singapore households saw growth in real income - which takes inflation into account - rising between 2.1 per cent and 3.6 per cent for each household member. For the next 40 per cent, the increase ranged between 3.7 per cent and 4.5 per cent. The less well-off recorded slower income growth last year, but between 2012 and last year, their real income per household member went up between 4.2 per cent and 4.6 per cent a year, faster than the rise of between 2.2 per cent and 4.2 per cent among the better-off. The Gini coefficient also rose slightly to 0.459 from 0.458 in 2016, which was the lowest level in a decade. It, however, remained the same after taking into account government transfers and taxes. The Gini coefficient measures income inequality from zero to one, with zero being most equal. 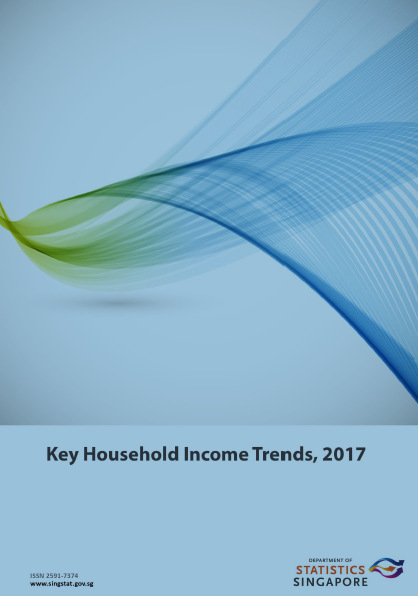 As for overall median household income - which is the midpoint in a range - the latest report showed it rose by 2 per cent in nominal terms, from $8,846 in 2016 to $9,023 a month last year. After accounting for inflation, the rise was 1.5 per cent. 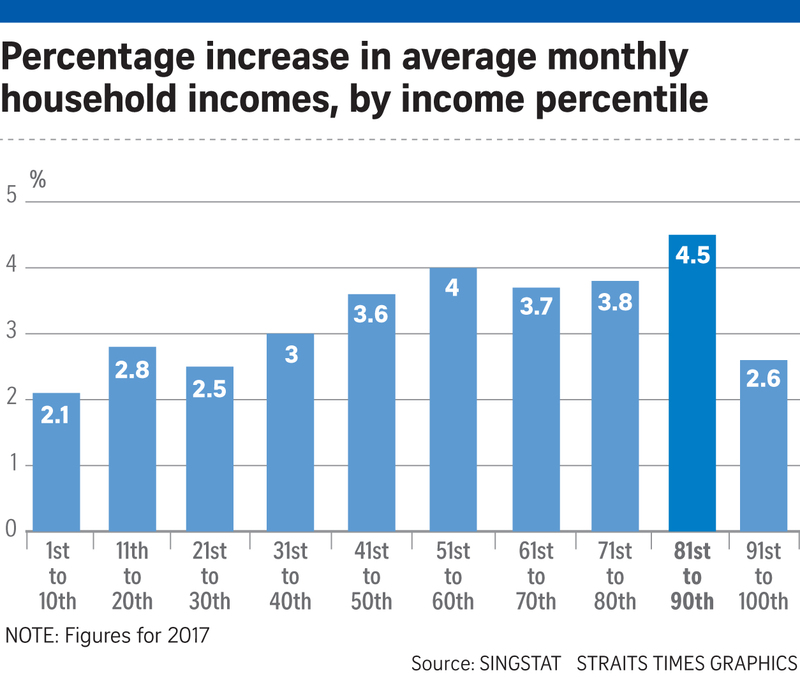 Experts interviewed yesterday said Singapore needs to keep a close eye on the income gap to ensure social mobility and prevent social stratification. 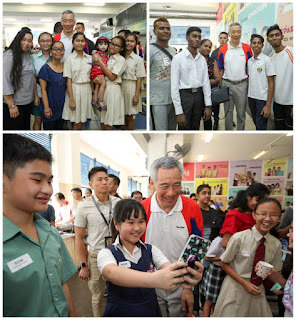 The danger of widening income inequality was highlighted by Prime Minister Lee Hsien Loong in a parliamentary reply this week. He warned that if left unchecked, it would lead to "a rigid and stratified social system" that would cause Singapore's politics to turn vicious, its society to fracture and the country to wither. The best long-term solution to managing the income gap is skills training and education, said SIM Global Education senior lecturer Tan Khay Boon. He also said that "social mobility is more important and effective over the long term to assist low-income groups to move into the middle income". 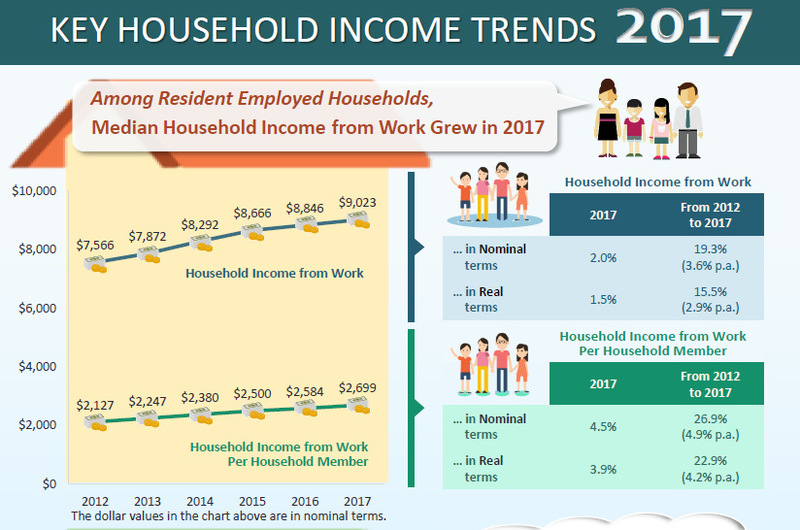 Meanwhile, the marginally wider income gap between the top and bottom half of all households last year reflects changes in the job market, said Maybank Kim Eng economist Chua Hak Bin. Professionals, managers, executives and technicians (PMETs) with higher skills, especially in IT, are in greater demand and earning more in today's digital economy. "At the same time, disruption like e-commerce in the retail sector has reduced demand and wages for blue-collar workers," Dr Chua added. Government transfers helped narrow the gap. The report noted that last year, on average, resident households, including those with no working person, received $4,433 for each family member from various schemes. Families in one-and two-room flats were given $10,245 for each household member on average, more than double the transfers received by households in bigger homes. The experts stressed that it is important to manage income inequality in Singapore. But they also said the income gap is inevitable because of Singapore's status as a global hub, attracting top talents from around the world who command high salaries. "The Government walks a fine line. While existing transfers are not insignificant, we don't want to be too generous until people have no incentive to work," said Professor Neo Boon Siong, dean of Nanyang Business School. The economy bounced back from a downturn last year, but Singapore households have yet to enjoy the fruits of this recovery. 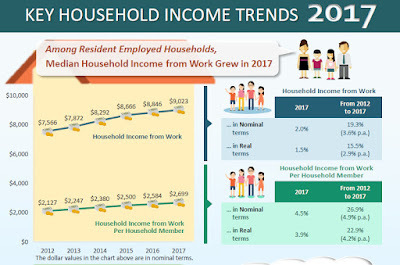 A Department of Statistics report released yesterday showed that overall median household income from work rose by 2 per cent in nominal terms from $8,846 a month in 2016 to $9,023 last year. In real terms, after taking into account inflation, the increase was 1.5 per cent, even as the economy turned in a better-than-expected performance, expanding 3.5 per cent for the full year. In contrast, the median household income went up 2.6 per cent in real terms in 2016 amid a lack-lustre economy. Economists gave two main reasons for this. First, inflation, which had been negative since 2014, turned positive last year. So real incomes, which were boosted by lower prices in 2016, were dented by prices creeping up last year. Second, it is typical for wage trends to lag behind economic activity, said United Overseas Bank economist Francis Tan. "If you are a business owner and you finally see some growth in revenue after a period of downturn, you would not immediately start handing out pay increments," he added. "You would wait until your profits grew stronger and you would expand your capacity first before thinking about rewarding your workers with wage increments or maybe even increase your headcount." Last year's economic recovery will likely translate into stronger growth in household income only this year, he said. Credit Suisse economist Michael Wan said that apart from economic growth, another important figure to watch is productivity growth, which will determine whether wage growth - and higher household incomes - can be sustained in the long term. "If wage increases are not matched with productivity, a company would lose competitiveness because its efficiency is declining and yet it has to pay workers more," he said. "So for growth in wages and incomes to be sustainable, you need companies to be more efficient." He noted that the Government has put in place various programmes and support schemes to encourage companies to be more productive. While labour productivity grew about 3 per cent last year, the fastest pace since 2010, Mr Wan said it was likely due to a pick-up in global trade. "Last year's productivity growth was driven by external factors. Now, we need to ensure it is something that can be sustained over the long term through structural changes."